The creation of the Southern 100 Club’s new race control headquarters has moved a step closer with help from long-time sponsor the Isle of Man Steam Packet Company. The Isle of Man Steam Packet Company has helped bring Groudle Glen Railway’s star attraction back home after a complete restoration off-island. A local martial arts academy will travel to the UK this week with support from the Isle of Man Steam Packet Company to take part in the 14th Taekwondo England Autumn Open Championships. Young people on the Isle of Man were taught some important life lessons through the medium of song and dance last week. 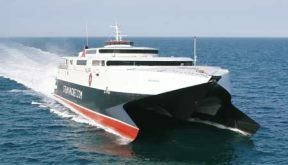 With Manannan’s final 2018 sailing scheduled for this Sunday (4th November), the Isle of Man Steam Packet Company has confirmed its fast craft will again remain in Manx waters this winter.